There are countless statistics which make for quite difficult reading when it comes to startup survival rates. For example, stats out of the United States tell us that nine out of ten startups fail in the long-run and only a quarter of new startups make it past the first year. Should you be discouraged by this? Well, it seems many are not in the least discouraged – in fact quite the contrary. In Dubai in particular we have seen a 12.5% increase in new business registrations in the first quarter of this year compared with the same quarter of 2014. And that’s no surprise to me. The environment in Dubai is one that inspires risk taking. This is a booming city where people recognize the tremendous opportunities to build something to greatness. You don’t get that everywhere, so when it is there in front of you, it is hard to ignore that urge to take the startup leap. The ad was apparently written by an Ernest Shackleton for an endurance expedition he was undertaking, and according to the story the response was overwhelming. People were lining up for their chance to join Shackleton and share in the glory should the journey be successful. Now aside from the “bitter cold” and “complete darkness”, you’d think Shackleton was writing about the startup world. Hazardous journey? Check. Low wages? Check. Long hours? Check. Safe return doubtful? Depending on how you interpret that, check. Honour and recognition in the event of success? Without a doubt. Essentially, if the entrepreneurial spirit is in you, odds be damned, you will go for it. The odds in fact mean nothing to you. Of course success is low. Otherwise everyone would do it. All that said, there are some key things you want to avoid in the way of potential startup mistakes, and that is what this article is about. A vast proportion of the startups that fail to get off the ground do so because they fall foul of one, or several, common pitfalls. 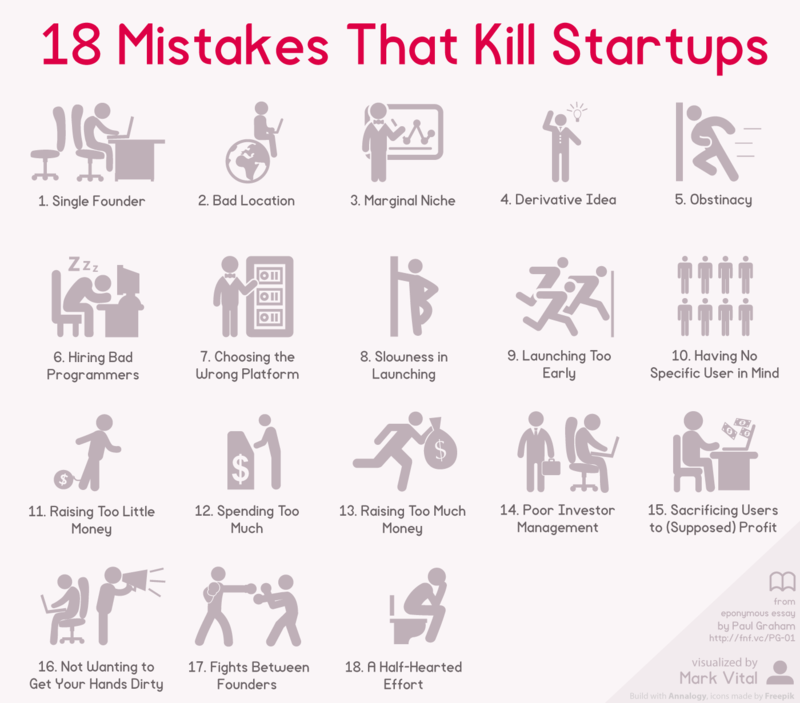 So whether you’re planning for a future launch, looking to build your own business while employed, or sitting on the next billion-dollar startup, don’t become a statistic – avoid these top mistakes startups make. 9 out of 10 startups fail in the long-run and only a quarter of new startups make it past the first year. While it may seem obvious, there are countless examples of businesses that get past launch and lose focus, simply because they didn’t have a long-term plan for the direction of their business. Whether your business plan is 50 pages or three, it needs to clearly outline who your business aims to serve, what its purpose is, what the goals are (both long-term and short-term), who your competitors are, how success will be measured, and so on. Laying this information out before you launch leaves you better placed to make decisions further down the line, to ensure your business doesn’t lose focus or start to neglect its core aims. There’s no need to write up a formal business plan the likes of which you probably haven’t seen since business school, but having a document in place that underpins the company goals and objectives is one of the most powerful foundations you can give your business. Finding clients is only half the battle. You also need to keep them. Yet over-promising and under-delivering is a sure fire way to ensure you fail here. It’s important to be realistic with what you are able to achieve. It’s far better to execute a smaller project successfully than to fail at a much larger one – which could cause a catastrophic dent in your reputation and your finances. It’s imperative that you understand your limitations and don’t force growth if you don’t have the resources to handle it. It’s a tactic that a huge number of new startups fail to employ, with a recent report by a Canadian startup consultancy finding that an incredible 90% of new businesses fail due to “self-destruction” rather than competition – i.e. they won the business, but were unable to carry it out. Many entrepreneurs are guilty of placing business growth above everything else, whereas the focus should be on delivering a high standard of service to your current client base first and foremost. In other words, grow strong before you grow up, and you’ll be mixing with the big players soon enough. Timing really is everything when it comes to startup success. Launch too soon and you risk undoing all the hard work you’ve put in so far by going to market with a product or service that’s simply not ready – or on the flipside, a product or service that the market isn’t ready for. Timing is in fact a tricky one: Getting there first is by no means a guarantee of success, yet arriving late to the party – so long as you have a superior product – can often work out just fine. Look no further than the case of Friendster (launched 2002) and Facebook (launched 2004). Of course if you wait too long then it may simply be too late. Fact is, there is no exact science to timing a successful launch, and there will always be an element of risk involved. So it’s vital that you have a deep understanding of both your business and the marketplace to give yourself the best chance here. You’ve built your business on a solid foundation with clear objectives, and you’ve resisted the temptation to scale too early. In fact, you launched just as planned. So why can’t you get any traction? And what to do now? Any successful entrepreneur will tell you that one of the most important skills to acquire is the ability to know when to stick to your guns and when to change direction. It’s paramount that you plan for every eventuality, but equally, you must know when a plan isn’t working and be ready to switch gears. The chances are there will come a time when, in order to survive, your business will need to adapt – whether it be down to changes in the market out of your control, or simply because it isn’t growing at a sustainable pace. Remember that all parts of a business are always adapting – and that includes your products and services. Do not be “stuck on your idea at all cost” when the marketplace is telling you to wake up and make some changes. Cold statistics, like the ones at the very beginning of this article, do not deter real entrepreneurs, nor do setbacks or hard times. If anything, they encourage you to work harder and smarter. Ultimately it is focus and perseverance that will lead you to success, but you have to also match that up with solid preparation. Do not be the type that says “Ready, aim, aim, aim” and do not be the type that says “Ready, fire, aim.” Stick to basic logic and avoid the common pitfalls I outlined above, and put the odds more in your favor.